Tonight I made a cioppino from Great Bowls of Fire. I love the combination of the swordfish and the shrimp in the tomato and fish-stock based broth. The recipe calls for a quarter cup of dry red wine — the one we used was so dark it almost gave the broth a purplish hue! 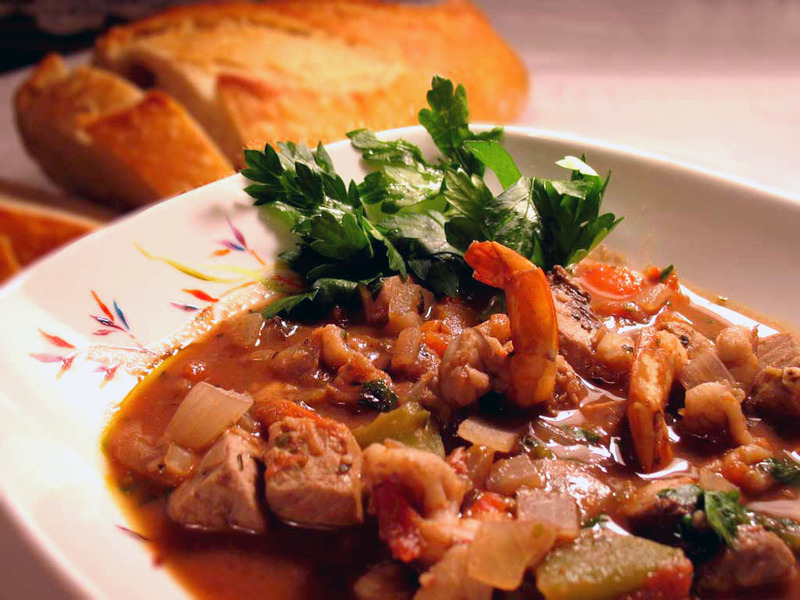 I loves me some cioppino! This is one of those GBOF recipes that you don’t really notice the heat. It tastes really good. Hmm, did you butterfly the shrimp? Makes it look like calamari or body parts or something. Well that sounds appetizing; let’s eat! Heat the oil over medium high heat in a large saucepan. Add the onion, bell pepper, garlic, and serranos and cook for 5 minutes, stirring frequently. Add the fish stock, stewed tomatoes, wine, oregano, basil, pepper, and salt and bring to a simmer. Cook for 10 minutes over medium heat, stirring occasionally. Add the swordfish and shrimp and return to a simmer. Cook for 15 minutes over medium heat, stirring occasionally. Stir in the tomato paste and parsley and cook for 5 minutes more.